Steve Roach, Ishq, Delia Derbyshire Appreciation Society, 20 Hours After Dawn, Keith Berry, Corrado Saija, France Jobin, Aerium and Alecsi. 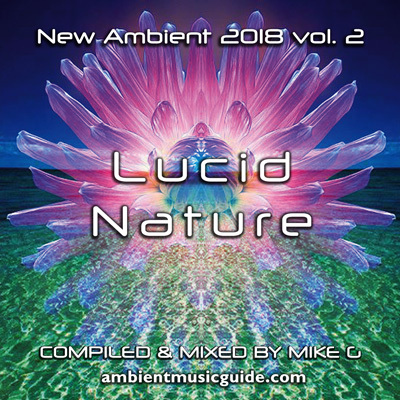 New Ambient 2018 is an ongoing mix series across the year, spotlighting choice tracks from recently released albums and EP's including re-releases of older titles. Ambient, chillout, spacemusic, trip-hop, downtempo breaks, environmental, psyambient, neoclassical, post-rock, instrumental folk, ambient techno/trance, new age, ambient dub and more. Hyperreal nature paintings and psyambient landscapes from Steve Roach, Ishq, Delia Derbyshire Appreciation Society, 20 Hours After Dawn, Keith Berry, Corrado Saija, France Jobin, Aerium and Alecsi. Reviews of an ever-growing selection of of the best album releases in various ambient and downtempo sub-genres since the early 1960's.